If your society is planning to go for redevelopment and looking for professional help please feel free to call us on , we can arrange a presentation to your society on the complete process of Redevelopment . 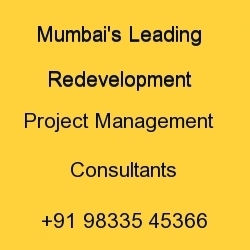 our society is Going for Redevelopment we Require PMC .. Address: Holy Family Co op society Ltd.
plot no 565 . Dr Ambedkar rd opp imppa house Pali naka Bandra West Mumbai 400050.
please call me for any information..
I/We like to meet for Redevelopment of Our residential society located at Kandivali west Area. looking for guidence for self revelopement of MHADA BLDG.